Maury Cou nty was designated as a Valley Sustainable Silver Community in the Tennessee Valley Authority’s economic development program, becoming one of only 25 communities across the nation. Maury County Chamber and Economic Alliance and local officials made the announcement Wednesday during an event entitled “Winning with Sustainability” at Puckett’s Grocery &Restaurant in Columbia. The MCCEA has been working on the designation since early spring, Wil Evans, MCCEA president, said. The Valley Sustainable Communities Program — which is in its second year — is designed to assist communities in evaluating existing sustainable programs, cataloging sustainable assets and increasing future commitments to sustainability. A silver status denotes an area that has community-wide sustainability initiatives, with some programs available to support the business community and economic development opportunities, according to the TVA. Companies are increasingly asking about sustainable practices as they seek communities for relocation or expansion, Evans said. “We are seeing a bigger push from companies that care about environmental components of communities as much as they do workforce, as much as they do land cost and as much as they do utility costs,” Aaron Stewart, a TVA Economic Development representative, said. More than 90 percent of corporate real estate executives who responded to a CoreNet Global survey said sustainability is a consideration in company location decisions, according to TVA. Communities involved in recycling, green practices, preserving parks and green spaces are now more likely to get higher rankings from companies seeking to expand or relocate, Stewart said. “We want to make sure the Maury County is designated as such, so it will be as attractive as possible to those companies when they are out looking around,” he said. 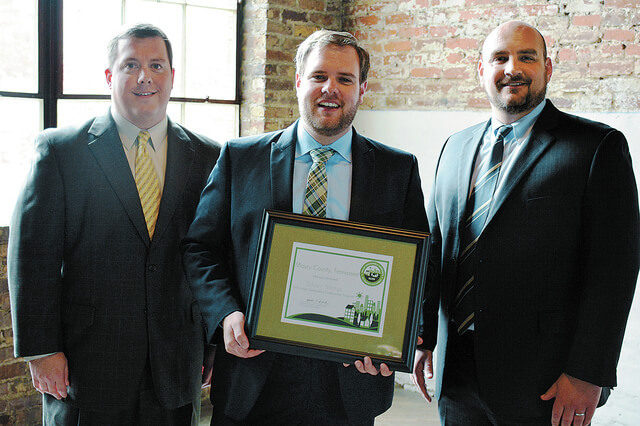 Maury County’s designation will allow the area to be highlighted on TVA’s website and receive targeted marketing efforts to 200 companies that have identified sustainability as important to their business, Travis Groth, MCCEA economic development director, said. Economic officials will now have a list of the community’s sustainable initiatives readily available for businesses or industries looking to locate here, Groth said. “We have got some real assets and treasures in the community, and now we’ve got those all compiled in a way that we can use going forward,” he said.